The answer is no. Web design isn’t dead. Although, the traditional meaning and value associated with web design have shifted north over the past few years. Website design has progressed alongside the development of technology and the web. Imagine using the advanced technology that is available to us today, to access a website and design that is stuck back in 2010’s old-fashioned ways, it just doesn’t add up. Web design is one of the most important methods of digital transformation and shouldn’t be left behind. Your web design should be used as a way to enhance your online presence and your brand’s overall digital style at the very least. From the growth of technology, the term Web Design has expanded and now covers a wider variety of user-centric design including user experience and digital system design. Keeping up with the growth in technology is a must for your businesses success. Your web design isn’t dead and should be at the forefront when keeping up to date with digital. The transition from Web Design to User Experience Design has been led by the evolution from basic web pages, to user-centric digital products or solutions. These are digital systems that are built and developed to replace outdated paper based systems or old fashioned processes in the workplace. Putting these systems in place will make the sharing of information and collaboration in the workplace so much easier and trustworthy from the features that the bespoke systems have to offer. 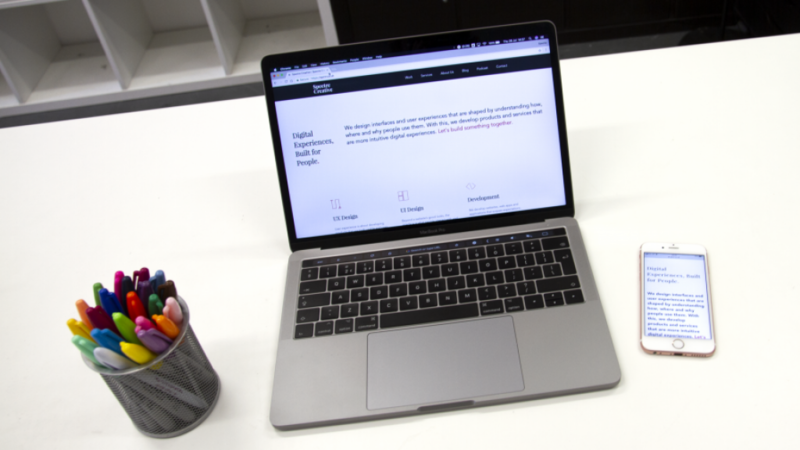 Having a website for your business is the first step of digital transformation, but implementing a digital system is the next. Web design isn’t dead as it covers all aspects of digital, user-centric design and focuses on saving time and keeping your customers happy. Web design definitely isn’t dead. In fact, it’s grown up with technology and has evolved into what we know as user experience design. Continue reading to find out more on why web design isn’t dead. There are many platforms and services online that will allow you to easily design, build and launch a website, without the hassle or expense of working with a web designer. These services can offer a stylish and modern web design for an e-commerce or portfolio website for example but are usually restricted to templates that allow little room for customisation. This can result in your website having an obvious, standardised design and structure. Websites that are built by standardised templates can offer nice web design, but lack user experience design. Using an automated, online service to build a website is one of the reasons why people think web design is dead. Whereas, we think these services are one of the main reasons that web design is still very much alive and relevant in today’s world web. Designing and developing a website or digital system from scratch by professionals will allow full customisation on your website which is essential for your companies branding and online presence. Your website will be bespoke to your business and will include all the features and design elements that you know are required to be successful online. Facebook and Instagram pages are becoming one of the most common points of contact for small, independent businesses to reach, target and share information and updates with their customers. Social media pages are today’s modernisation of the old school blog, allowing small businesses to easily set up and provide the relevant information that potential customers will be looking for, avoiding the initial costs of designing and hosting a website. Social media might be available to everyone, but should it be used instead of a website? The answer is, of course not! How many times have you been browsing a Facebook page and wanted to visit their website for more information, only to find out they don’t have one? Most of the users visiting your Facebook page will more than likely expect to find further information, be able to make a purchase or a booking from a website that is linked on your business page. Basically, a Facebook page should be used as a way of keeping your customers up to date with recent activity within your business and to make them aware of the content on your website. Social media should be used to drive traffic and potential customers to your site, and not as a way of replacing a website. Your web design is key to maintaining an overall presence and style online. The use of colour, branding, photography and content on your social media pages should be a reflection of your web design and visual style on your site. Finding and sustaining a consistent style across all online platforms will be much harder without a website that already supports your visual standard. Search Engine Optimisation is one of the most important objectives to a business that is operating online. Launching a website for your business will be the most effective way to boost your ranking on a search engine results page. While listings are ideal for local search, providing directions and a phone number to get in touch straight away, if your business doesn’t have a website, your listing won’t be as effective as users will be left disappointed as they cant be directed to a website. Mobile apps are the most effective way of loading and viewing a website on a mobile or tablet device. Most websites, especially e-commerce, are encouraging their customers to download their app which will provide a better user experience on these devices for their customers. Although, your website shouldn’t be left behind or replaced after developing an app. A fully responsive website still needs to be in place for both mobile and tablet users that haven’t downloaded your app, and users accessing your site via a desktop. These could be new or potential customers, or people visiting and finding your website through a referral link from a social media post for example. If your mobile app is simply a responsive version of your site, you will need to keep both your original web design and app design up to date. At the end of the day, your website is the basis of your app design and your customers will still use both methods to access your site. Web design isn’t dead and can’t be replaced by implementing an app. Web design has so much more to offer than pretty websites, all thanks to user experience design. At Spectre Creative, we design and develop digital systems that will drive your businesses journey to digitalisation. We create systems that will transform your workplace from paper to paperless. Replacing your current process with a digital system will save your employees time while keeping your customers happy. Web design isn’t dead and, is in fact, living through one of the most successful and exciting times for all kinds of web design.